The importance of correct and adequate sampling of central nervous system in laboratory animals is stressed. Lesions pertaining to neurons such as necrosis, loss, and vacuolation are illustrated. Neuronal changes affecting the cerebrum and cerebellum are included. Distal and proximal axonopathies with examples are described with representative figures. Other changes discussed include demyelination, myelin oedema, and inflammatory lesions in different laboratory animals. Changes occurring in glial cells and choroid plexus are also described. 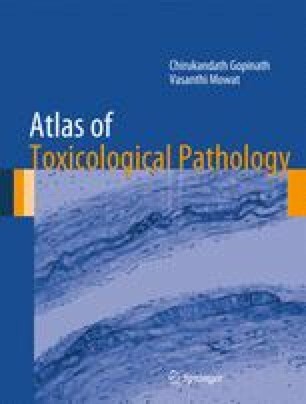 A brief section on induced gliomas in rats is also included.